Hi, I'm James. I'm the Global Director, Marketplace at Tes. Tes' mission is to help teachers through every step of their careers. Our Resources Marketplace offers hundreds of thousands of free and premium resources created for teachers, by teachers. Our community downloads over a million resources a day from the service. Before Tes, I was co-founder of a San Francisco software company, Tangient LLC. In March 2005 we launched Wikispaces, a wiki hosting platform designed to be easy enough for everyone to use. Wikispaces is one of the largest wiki hosts in the world with over ten million members, millions of wikis, and at peak over 50 million unique visitors. Tes acquired Wikispaces in 2014. From October 1999 through June 2003, I worked at VA Software (aka VA Linux), most recently as Director of Engineering for the SourceForge enterprise product. Before joining VA full time, I worked on VA's Linux.com property as a Senior Developer, spent a summer at Digital Fountain, and managed a network support helpdesk. I hold a BS in Applied Economics and Management from Cornell University. I live in San Francisco with my wife Amanda, our two sons, and a cat. I spend my copious spare time on various projects and distractions. 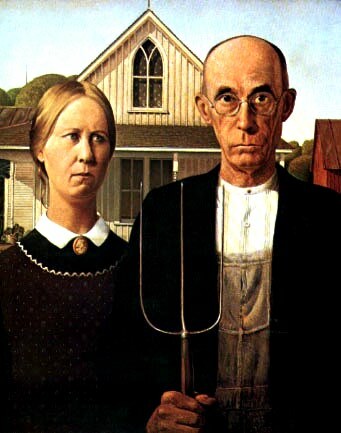 If I were older, scarier-looking, and balding, I might resemble the gentleman from Grant Wood's American Gothic. It should be noted that Amanda does not resemble the gentleman's grown-up daughter.